Nancy Drew is a 2007 American mystery comedy film loosely based on the popular series of mystery novels about the titular teen detective. It stars Emma Roberts as Nancy Drew, with Josh Flitter and Max Thieriot. 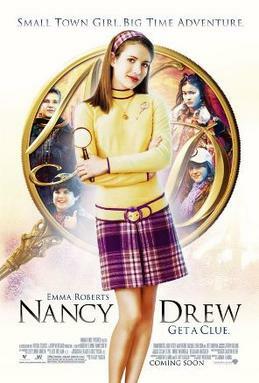 Nancy Drew (Emma Roberts), an amateur sleuth, and her widowed father, Carson Drew (Tate Donovan), move from their quaint hometown River Heights to California, where Carson has a temporary job. Carson encourages Nancy to focus on living like a normal teenager, instead of getting herself into trouble with crime- and mystery-solving. However, unbeknownst to Carson, Nancy chose their California house because of its famously unsolved mystery of the death of the movie star Dehlia Draycott. Nancy Drew 2007 Film Wiki is a FANDOM Movies Community.